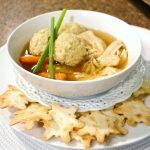 Hearty pieces of cooked chicken breasts in broth seasoned with onions, celery, carrots, and poultry seasoning is the perfect base for the matzoh balls which are made and cooked separately in chicken broth then added to the soup base. Soul warming soup on a cold winter day. In crock pot, place chicken breast, sliced onion, celery , carrots and 32 ounces chicken broth. Place on high for 4 hours or low for overnight. When fully cooked, drain vegetables from meat. Place reserved broth and carrots in a large saucepan. Shred chicken and return to reserved broth. Broth should be clear. This is your base for the Chicken Matzoh Ball soup. In medium mixing bowl, combine meal, eggs, oil, water, salt and seasoning. Mix with a fork until well blended. Cover and refrigerate for 30 minutes. In another large saucepan, bring the remaining 32 ounce chicken broth to a rolling boil. With an ice cream scoop or large spoon, shape matzoh into balls. Drop balls into boiling chicken broth. When they fluff and rise to the top, remove and place balls into soup bowls or chicken soup. Strain any Matzoh material from the chicken broth, then add this broth to the Chicken soup base. To serve: Place 3 Matzoh balls in soup bowl, add pieces of chicken, carrots and then the broth to cover. Or ladle the entire soup into the bowl as desired. Garnish with chive stems. Set your table with a cute napkin fold made of paper with Menu.